From the beginning of pregnancy to the birth, the body of the pregnant woman will have to adapt constantly to let the embryo then the fetus develop comfortably. Osteopathy is an accompaniment to traditional obstetric care, it will allow the future mother to feel better during her pregnancy and to approach it in a more peaceful way. Osteopathy relieves the functional disorders encountered during the different moments of pregnancy through gentle and minimally invasive techniques (functional techniques, myotensive techniques, craniosacral axis, ...). Osteopathy will help maintain a good balance of body and help to adapt to changes that the body may encounter. To find out more, here is a more detailed article on accompanying pregnancy throughout osteopathy. 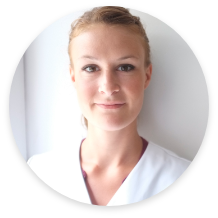 I practice a rather gentle osteopathy, having a global approach and using techniques that vary according to each individual patient’s needs and reasons for consultation.